Ever since Michael J. Fox using those self-lacing shoes as Marty McFly in Back to the Future back when, everyone wanted to see that kind of technology in action. Needless to say, we had to tie my shoelaces manually thousands of times until the technology became available. And when it did launch, it was pretty expensive. But Nike has a more affordable pair of self-lacing shoes out right now, which have nothing to do with those Back of the Future gimmicks. The new Nike Adapt BB have smart features built-in, which are meant to improve the performance of athletes when it matters most. Retailing for $350, the Nike Adapt BB targets basketball players in particular. Nike doesn’t just want wearers to be able to lace their shows without reaching for the laces. Instead, it’s using sensors in the shoe to allow players to adapt shoelacing to fit their needs, so that the shoe always feels comfortable, and is ready to deliver the best performance. Nike revealed a new shoe called the Nike Adapt BB on Tuesday. 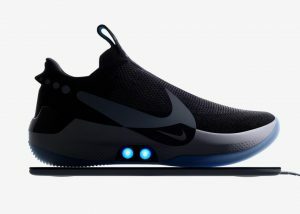 The shoe features the next generation of Nike’s EARL self-lacing technology, as well as a companion app that can instantly change how the shoes fit using Bluetooth. It will launch on February 17 and cost $350 — far cheaper than Nike’s first self-lacing shoe. Nike execs are calling the Adapt BB the start of the company’s evolution from “footwear to firmware,” with more self-lacing shoes on the way. “Say goodbye to the shoelace,” Michael Donaghu, Nike’s director of global footwear innovation, told a group of assembled media and influencers from a stage in the company’s New York headquarters on Tuesday. The presentation was held to reveal the Nike Adapt BB, the company’s new version of a self-lacing shoe. It’s a performance-focused and heavily upgraded version of Nike’s first self-lacing shoe, the Hyperadapt 1.0, which was built for general consumers. The BB stands for “basketball,” and the shoes were created to be played in, first and foremost. The new shoe is all about fit, Donaghu said, which is something top of mind for these players. Much of that functionality won’t be available at launch or in this first iteration, but it’s the start of where Nike is going with its tech-enabled footwear. The Adapt can send data about usage and analytics back to Nike, should users allow that. The data could also eventually be used to track athletes’ movement and performance, which Nike says can help it offer new products or services to customers. “We are essentially putting in a mobile sport research lab on the feet of athletes all over the world,” Donaghu said, adding that Nike will provide incentives to share this data. Over the course of a basketball game, the foot can expand almost a half-size during play. A level of fit that feels comfortable at one point might feel constrictive just 24 minutes later. Because the needs of the foot change at any given time based on the sport, its duration and on specific movements, like a slashing cut to the basket, ‘perfect fit’ is a floating target. “During a normal basketball game the athlete’s foot changes and the ability to quickly change your fit by loosening your shoe to increase blood flow and then tighten again for performance is a key element that we believe will improve the athlete’s experience,” said Nike VP Creative Director of Innovation Eric Avar. The Nike Adapt BB are fitted with custom motors and a gear train that sense the tension needed by the foot, and adjust accordingly to keep it snug. Nike explains that the tensile strength of the underfoot lacing can pull 32 pounds of force, which equal to the power of a standard parachute cord. Players can use the FitAdapt tech to manually input different settings so that they can quickly adapt snugness to different moments of the game. A mobile app for iPhone or Android can also get the job done. Nike explains that players will be able to set up different lace tightening settings for timeouts, gameplay, and even warm up. Future firmware updates will support various other settings. Users can also update the firmware on the shoe, potentially unlocking additional functionality. It’s also the beginning of the Adapt platform, which Nike said it hopes to expand into running and lifestyle categories with different shoes. Nike allowed attendees hands-on experience with the shoe, along with a pre-paired smartphone for testing purposes. The first impression is that the adaptive lacing system is very comfortable, offering a very snug feeling. The interface is easy to use, and the shoes can get extremely tight. The shoes were also surprisingly loud due to the speed at which the internal motors clamp down on the foot. For whatever reason, the experience was less disorienting than lacing up the Hyperadapt was. The shoe should be pretty resilient. Nike’s self-lacing technology is not just a marketing gimmick meant to make you look as cool as Marty McFly. The shoes are intended to actually help professional players during games. The Nike Adapt BB will start shipping in about a month, on February 16th. In the future, the technology will come to other sports and lifestyle products from the company, Nike said, without revealing other details. Posted in Business, Health & Body, News, Sports.